While Spring Training is a great vacation for fans, it isn’t really baseball. Oh, they play games and all. But, they don’t count. The players are there to warm up or to earn a place in the real season. 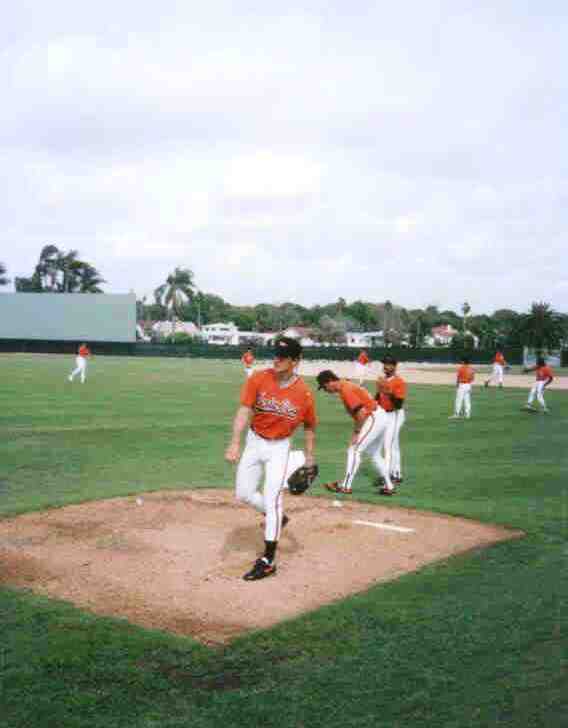 Orioles catchers Chris Hoiles & Rick Dempsey warm up their pitchers. Both are still Orioles — Chis is an instructor, Rick a broadcaster. 1970s-era reliever Sparky Lyle admitted he would avoid signing his contract until Spring Training was nearly over so he wouldn’t have to go so early. Once he arrived, he used the games merely as an opportunity to heat up his fast ball. He didn’t care how many home runs the opponents scored. It wasn’t the point. Baseball history is littered with players holding out, not showing up, or simply disappearing when Spring Training arrived. In 1943, New York Giants pitcher Carl Hubbell was so unhappy that his team was forced (by restrictions imposed during World War II) to hold their Spring Training in icy New Jersey, that he refused to go outside and spent the entire month playing ping-pong, according to Charles Fountain in his wonderful book “Under the March Sun”. Spring Training is an important time for players, especially for those young rookies and aging veterans who are working hard just to make the team. For some regulars, it’s about getting back into the groove. For others, it’s about golfing in the afternoon. Spring Training for fans is a time to put on sun screen and talk to the people around you about how cold it was back home the day you left. Sometimes I think we fans are simply intruding. We’re trying to make Spring Training into an “experience”. Cities in Florida and Arizona spend multi-millions of taxpayer dollars to attract teams. For them, Spring Training is a huge tourist draw. But, Spring Training at its core is just a warm-up, a rehearsal. Sure, it’s wonderful to see the players again, and Spring Training can get you much closer than you’ve ever been before. Pitcher Mike Mussina, one of my all-time favorite Orioles. He was inducted into the Orioles Hall of Fame in 2012. Look how close you can get in Spring Training! And, just stepping out and having the warm sun on your face and a lush green outfield spread out before you is an awesome rite of spring no matter where it is. It’s not about the games. It’s just about feeling baseball in your bones again. I can’t remember much about the games that spring, although I went to plenty. 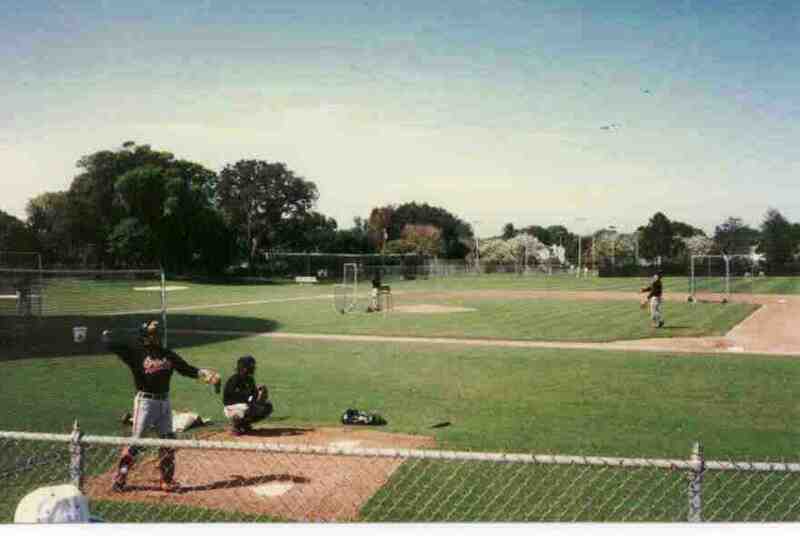 And, I watched the Orioles work out at their practice field every morning. The Orioles’ Cal Ripken, Jr. played in a record 2,632 consecutive major league games. (But, he took some Spring Training games off.) He’s the second from the right here. My trip to Spring Training is one of my fondest memories, not because of the games, but because of the people I met along the way. I met a ton of Canadians one night who came to watch the Blue Jays. A ton. They are a very friendly – and chatty – country. One afternoon, I met a bunch of St. Louis Cardinals fans who were overjoyed that Al Lang Stadium played the Budweiser jingle during the 7th inning stretch, just like back home. That day, Stan Musial and Frank Robinson threw out the first pitches of spring. I met an old retired Baltimore bartender who told me about players from the 1950s and ’60s who came to his bar after games. I met a couple who were certain that I was a scout, because they saw me at several games and I was always taking notes. When I assured them I wasn’t, they just nodded knowingly in that “it’s ok, your secret’s safe with me” sort of way. I met a little kid with an autograph book who didn’t know whose autographs to get. His dad was no help at all. So I would point out players so he could run over and ask them by name. And, I met an Oriole. I was at a game early (of course) and taking notes, when I heard someone say, “You’re here every day.” And, I looked up and it was Elrod Hendricks, one of Baltimore’s most beloved Orioles. He was the bullpen coach at the time. But, he had been a catcher back in the day. Even hit a home run in the 1970 World Series. He was a member of the Oriole family, well known for his charity work and outreach in the community. Every day after that, at every workout and game, he would come over to chat. He showed me what to look for in pitchers. How to really get the most out of Spring Training. How to see it from a player’s and a coach’s perspective. And, he told me about himself and his life in baseball. How he came up in the minors when the game was integrated, but the world was still segregated. About singing. And, The Platters. So my fondest Spring Training memory isn’t about baseball at all. It’s about people who love baseball. 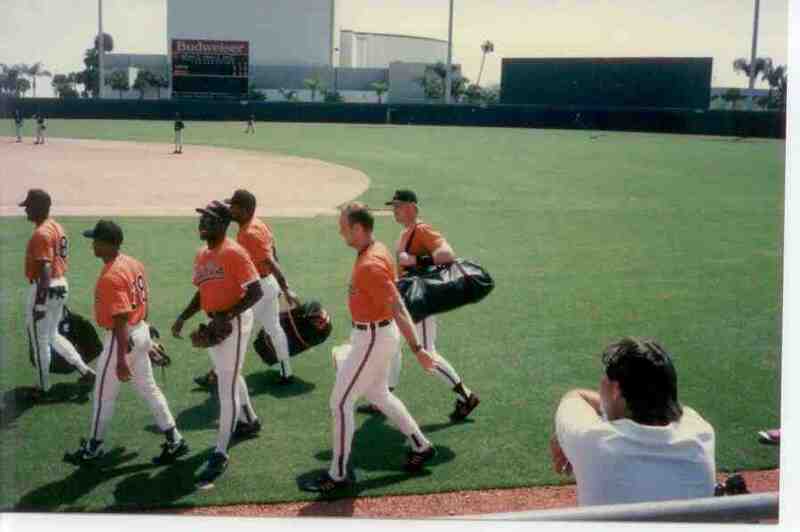 The Baltimore Orioles left St. Petersburg after the 1995 season for Ft. Lauderdale. In 2010, they moved to luxurious new digs in Sarasota. They will win the World Series this year. The Tampa Bay Rays actually play in St. Petersburg, so there’s less of an interest in Spring Training there today. But, pretty Al Lang Stadium is still down by the waterfront, near the Salvador Dali Museum. 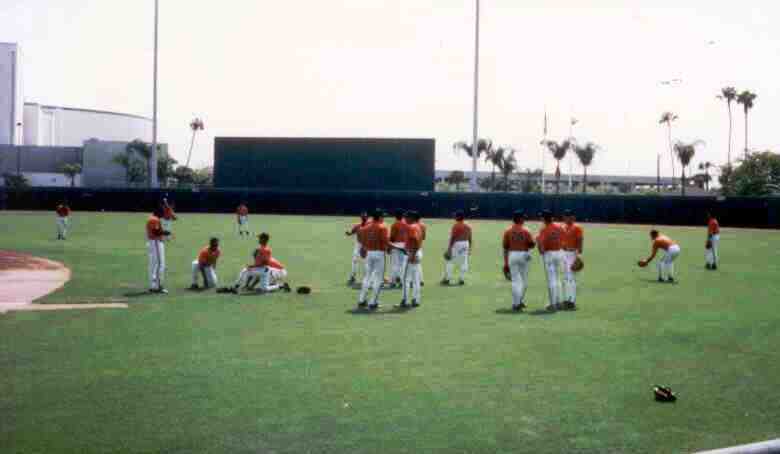 This month, the stadium hosted a handful of games played by “prospects” of several teams, including the Orioles. Elrod Hendricks wore a Baltimore Orioles uniform (#44), as both player and coach, for 37 years, an Orioles record. He passed away in 2005. He’s the only Oriole I’ve ever spoken to. This entry was posted in Baltimore Orioles, Baseball, Life and tagged Cal Ripken Jr., Elrod Hendricks, Mike Mussina, spring training, St. Louis Cardinals, vacations by Jackie, The Baseball Bloggess. Bookmark the permalink. Someone asked me what I was going to write about now that I finished the series … what’s left? And, I said, “What’s left?? There’s an ENTIRE season ahead, it hasn’t even started yet!” Go O’s! !